Today I want to discuss is The Best Cards to Own for Big Spenders. Not everyone has the ability to spend hundreds of thousands or even millions of dollars per year on their credit cards. Small business owners like Physicians, Dentists, Podiatrists, Chiropractors are in the unique position to be able to take advantage of some really nice perks from the hotels and the airlines by proper use of spending on credit cards. As I have said numerous times on this blog, you have to determine your travel needs and your travel goals prior to embarking on credit card sign ups. What do you value most? Is it Luxury hotels and First Class airfare? Is it lots of long weekend trips to see this great country? Do you want to travel to Europe, Asia or Africa? How important is airline and hotel status to you? All these different goals require a different miles and points strategy. The only thing you can do wrong when trying to accumulate miles and points is to not have a plan for what to do with them. Big spenders who want to travel in First class cabins internationally would be much better served using a credit card like the Starwood Business card for purchases in non-bonus earning categories. For example, if you spend $1M a year on a cash back card, you would earn $20,000 in cash back. That might cover the cost of one first class ticket to Europe. On the other hand, placing just $100K on the Starwood card, would earn you 125K airline miles which would probably be enough to purchase an award ticket with the same itinerary. If sitting up in the front of the aircraft isn't important to you, or you prefer travel within the US, the Starwood card would be of little value to you for air travel. In this situation, you might be better off with the Southwest Airline personal and business cards or the airline card of your preferred carrier. With your approval of both Southwest cards, you would receive a 50,000 point sign up bonus for each card. That's almost enough to earn the Southwest Companion pass. You would only need to spend another $10,000 on those cards to earn the pass. The Southwest companion pass is good for up to two years. It is reusable unlike most airline companion passes. It is good for travel on the same itinerary as the purchased ticket whether it was a paid fare or booked with miles! For domestic coach travel, you also might be better off with just a straight 2% cash back card for all other airlines besides Southwest. For Hotel stays, there are two Hotel branded credit cards that provide mid or top tier status just for spending on their cards. The Citibank Hilton Reserve Visa earns you Top tier Diamond status for $40,000 in annual spending. For generic spending, it earns 3 Hilton points per dollar spent. 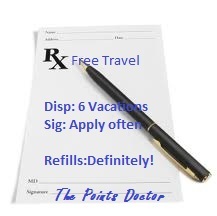 At drug stores and supermarkets it earns 6 Hilton points per dollar. At an average of 4.5 points per dollar spent, $40,000 would yield 180,000 Hilton points. That's enough for a 6 night stay at a category 6 Hilton. Using a valuation of $250/ night plus tax on that hotel room, that would yield approximately 4% on your spending. Having Hilton Diamond status would give you the best chance for being upgraded to a preferred room or suite. The American Express Starwood cards provide you with Gold status for $30,000 in annual spending. The business and personal cards currently have a 25,000 point sign up bonus. With the points earned from two sign up bonuses and the points obtained from $30,000 in spending, you would have 80,000 Starpoints.. That is enough for a 5 night stay at a Category 6 Starwood property like the St. Regis in Punta Mita, Mexico. My wife and I will be visiting there in January for 6 nights. With my status, I expect to be upgraded to a suite. By checking Trip Advisor reviews, I was able to identify the name and contact information for the hotel manager. I have already spoken with him and he indicated it would be no problem with the upgrade. The American Express Delta Reserve Personal and Business cards can earn you top tier Diamond elite status just for spending. (albeit $280,000 in spending- less the first year due to sign up bonus) I will have an upcoming separate post on "How to Earn Elite Status on Delta From the Comfort of Home". The big advantage with Delta Elite status is that you can rebook with no fees. When an award ticket becomes available, you can reserve it without concern for whether you can actually make that trip. With no re-booking fees, you can book seats without penalty while you figure out how you will arrange for the rest of the trip. I can't emphasize enough how important that is to be able to grab award seats when they become available. The Chase United Mileage Plus Club card offers 1.5 United miles per dollar spent with no annual cap on mileage. It comes with a $395 annual fee that includes free lounge access, waive late ticketing fees, 2 free checked bags, priority check-in and boarding. You also get a $95 statement credit with your 1st purchase. The 50% miles bonus on all purchases makes its miles earning rate exceed the Starwood cards. If United is your primary airline, then this would be your best option for earning miles on United. The Chase British Airways Visa card can earn you a free companion ticket with a $30,000 annual spend on the card. At present, there is a 100,000 miles signup bonus (after $20,000 in spending), enough for two first class airfares to Europe. The big downside are the hefty fuel surcharges that BA puts on its award tickets. Those two "free" tickets could cost you $1000 each. Some people consider the use of the companion ticket as paying for two coach fares and getting a 3 class upgrade on their tickets. Big spenders can reap the benefits of their spending by selecting the cards that match their spending patterns and travel goals. I have no affiliation with any of the above banks.